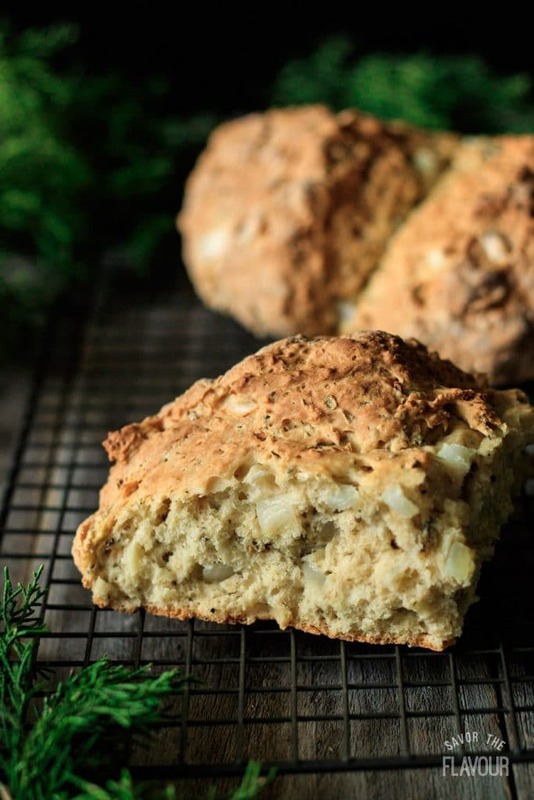 Oregano onion soda bread is an easy recipe for a deliciously savory loaf that’s sure to be a hit on St. Patrick’s Day. This crusty, no yeast bread uses buttermilk and baking soda to make it rise. No machine is required to mix up the dough! 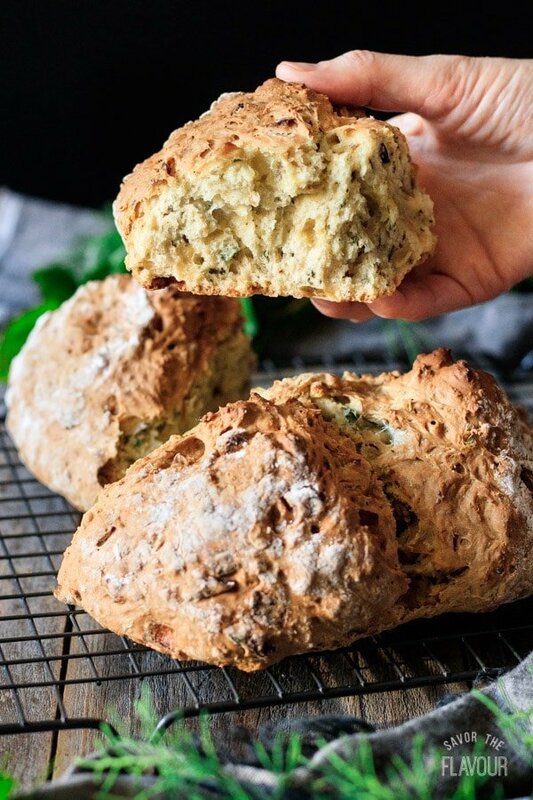 Perhaps the unsung hero of all quick breads, soda bread is a unique free-form loaf that contains no baking powder or yeast to make it rise. Interestingly enough, the chemical reaction between the baking soda and the acidic buttermilk makes the dough rise. 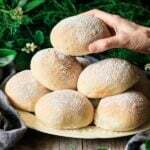 Since there’s no yeast involved, a freshly baked loaf of soda bread can be ready to eat in less than half of the time it takes for a yeast bread. 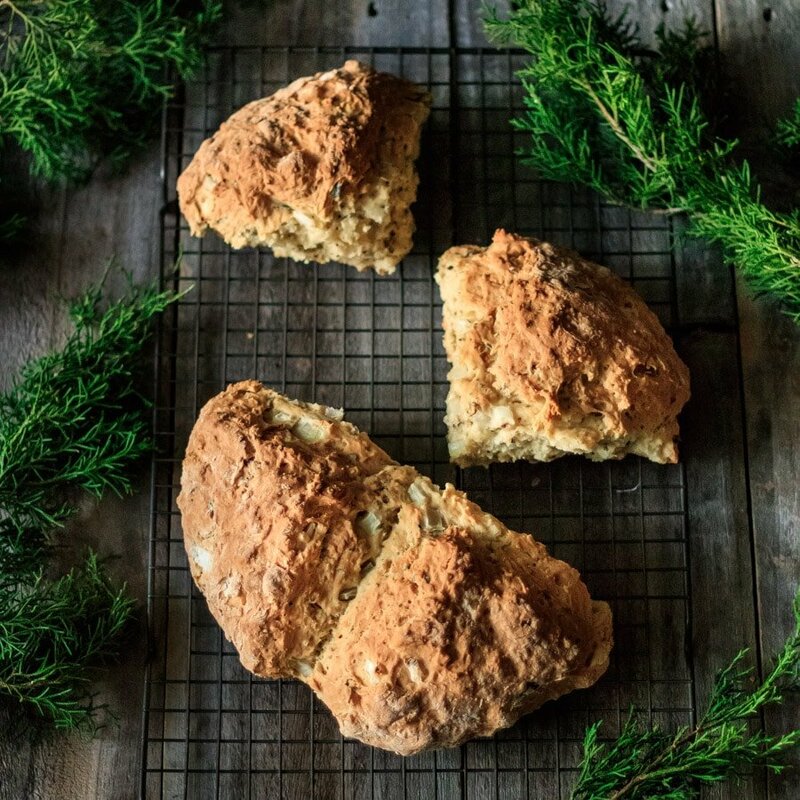 Soda bread has a similar nutritional profile to traditional yeast breads. You can make it healthier by substituting whole wheat flour for the white flour. This bread is actually quite filling, so you won’t need a large piece. What do you eat soda bread with? Dip into a bowl of hearty soup. Place a piece of cheese on top of your slice. Serve it with fresh fruit and veggies. Make it into a sandwich. Why do they call it Irish soda bread? 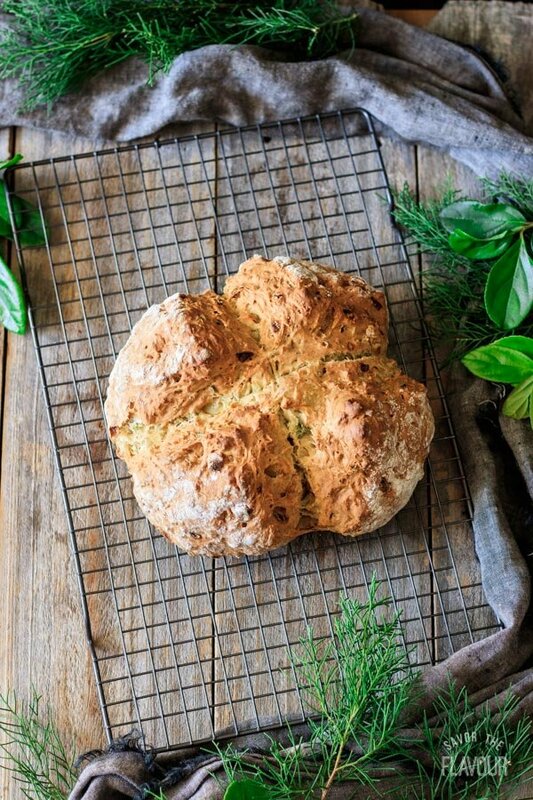 This Irish bread gets its name from the baking soda that is used to make the bread rise. Are bicarbonate of soda and baking soda the same thing? Yes, they are the same thing–just different names. Americans and Canadians use the term baking soda, while Brits, Australians, and New Zealanders use the term bicarbonate of soda (or “bicarb” for short). Are soda bread and sourdough the same thing? No, they are not the same. Sourdough is bread made from natural yeast, while soda bread contains no yeast, just baking soda, to make it rise. Can soda bread be frozen? It absolutely can! Make sure to seal it tightly in a zip-top plastic bag, pressing out the extra air. Freeze for up to 1 month. 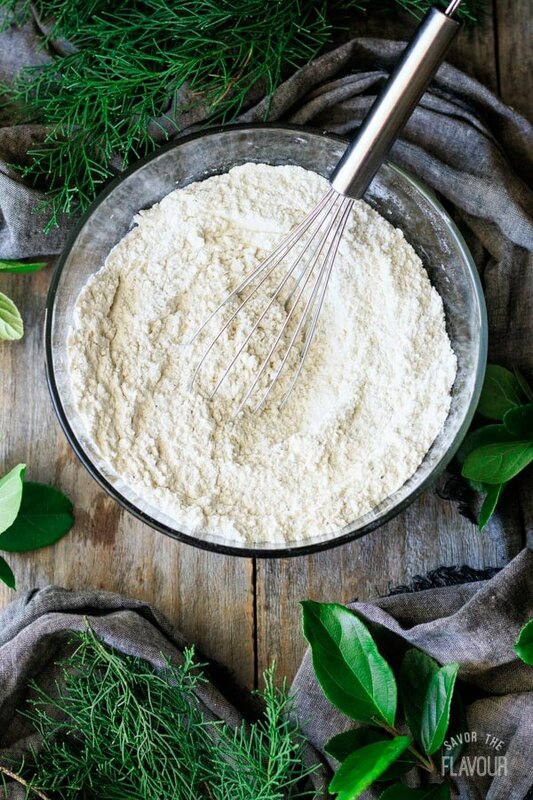 Whisk together the dry ingredients in a medium mixing bowl. Melt the butter in a small skillet over medium-high heat until bubbly, then add the onions and sauté until golden brown. Add the sautéed onions and chopped oregano to the dry ingredients, then mix in enough buttermilk to make a sticky dough. Turn out the dough onto a lightly floured surface and knead gently a few times, then shape into a ball. Place the loaf on a baking stone or parchment-lined cookie sheet. Cut a deep X into the loaf, cutting almost all the way through the dough. This helps the bread cook properly. Bake at 400 F for 45-55 minutes, until the loaf is well browned on the top and base and has an internal temperature of 200 F on a meat thermometer. Let it cool completely on a wire rack before serving to allow the bread to finish cooking. Use bread flour instead of all-purpose flour for this recipe. Bread flour has a higher protein content, which creates more gluten in the dough. Gluten gives the dough strength, allowing it to rise higher as it bakes and giving it a more pleasant texture. Be careful not to overwork the dough, or the bread will be tough. 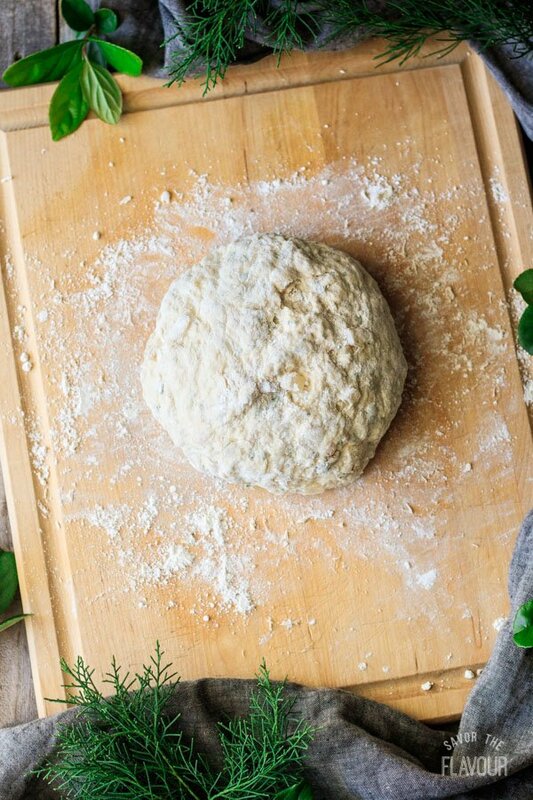 The more you knead and handle the dough, the more you strengthen the gluten strands. You need some gluten to create a good laof, but not too much. Just gently knead a couple times, and you’ll be fine. Bake the bread until it’s well browned on the top and base and has an internal temperature of 200 F. Pulling out the loaf too soon will result in a doughy, undercooked loaf. 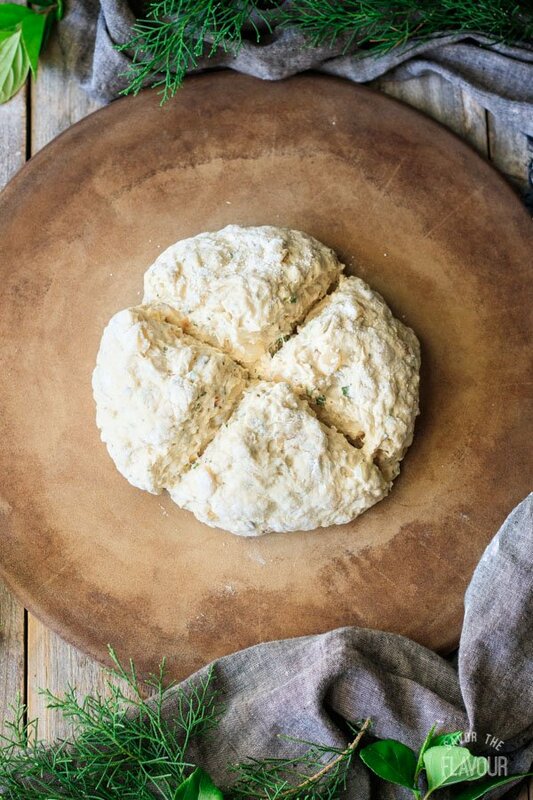 Make sure to let the soda bread cool completely before serving. Freshly baked bread is full of steam, and the bread needs time to release the steam and finish cooking all the way through. Cutting in too soon will make the dough dense, stodgy, and doughy. Eat the soda bread as soon as it’s cooled for the best flavor. Otherwise, freeze it in a zip-top freezer bag until needed. Soda bread goes stale and bland after even 24 hours at room temperature. If you can’t freeze the cooled soda bread right away, seal it tightly in a zip-top plastic bag at room temperature. Do not refrigerate; it will make the bread go stale more quickly. Toast leftover soda bread to serve with soup or use it in a sandwich. If you like this bread recipe, you might like these other Irish bread recipes! 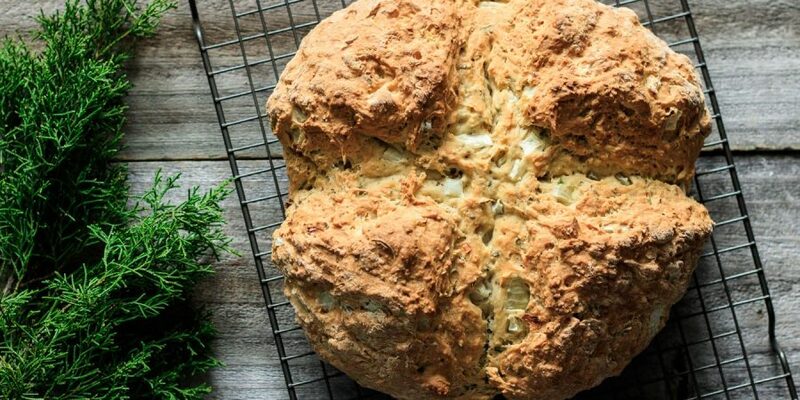 Irish Boxty Bread: a delicious no-yeast potato bread. Waterford Blaa Buns: a traditional Irish bun used for a chip butty sandwich. 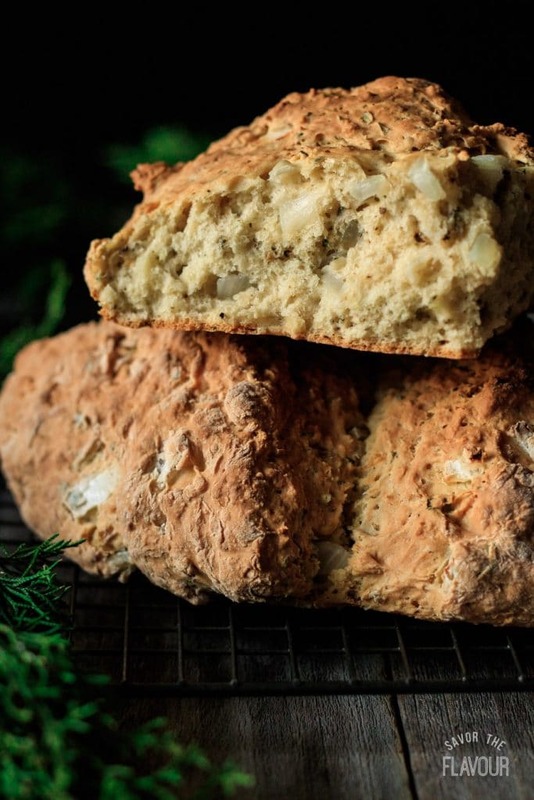 The pleasure of a 5-star review of this savory Irish soda bread would be greatly appreciated. Rinse the fresh oregano and pat the stems dry. Remove the leaves by running your fingers down the stem from the top to the bottom, then finely chop the leaves. 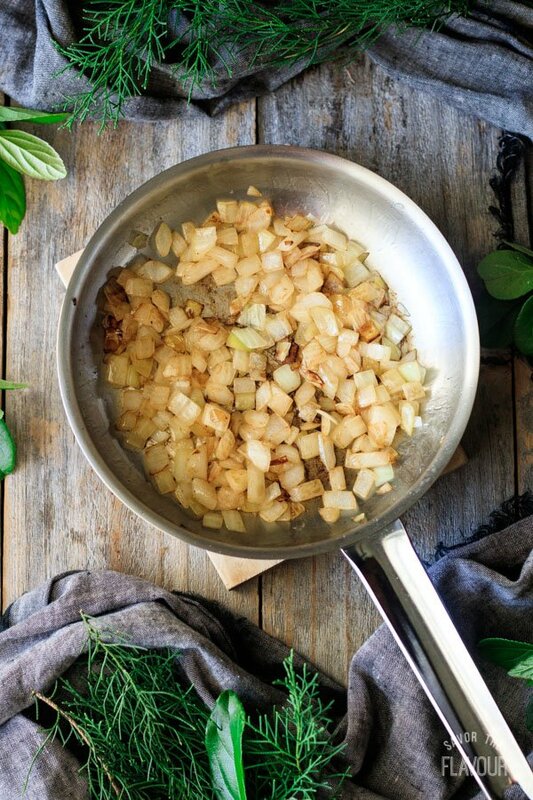 Chop the onion, then melt 2 tablespoons of butter in a small saucepan over medium-high heat. Add the onions and cook until golden brown, stirring frequently. 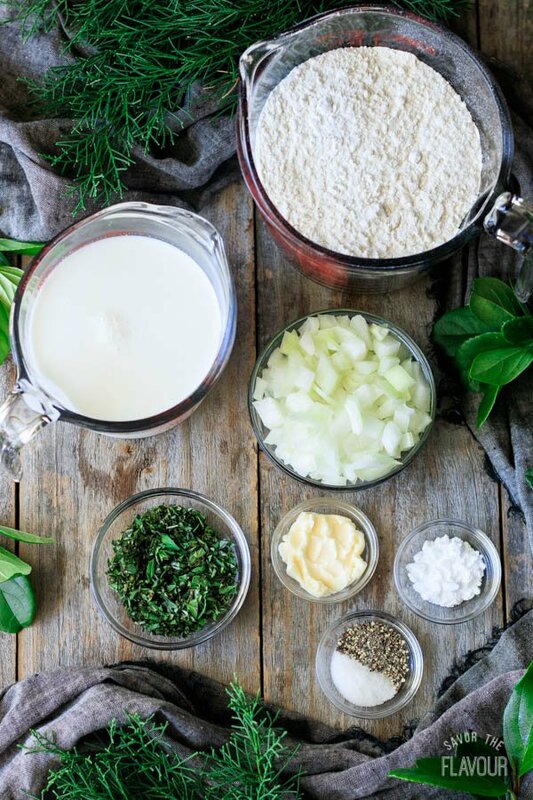 Whisk together the flour, salt, and baking soda in a large bowl, then stir in the oregano and onion. Make a well in the center of the mixture. Pour half of the buttermilk into the well and mix with your hand until the dough starts to come together. Gradually add more buttermilk until a sticky dough is formed and no flour remains in the bottom of the bowl. If you have extra buttermilk, save it for another bake. 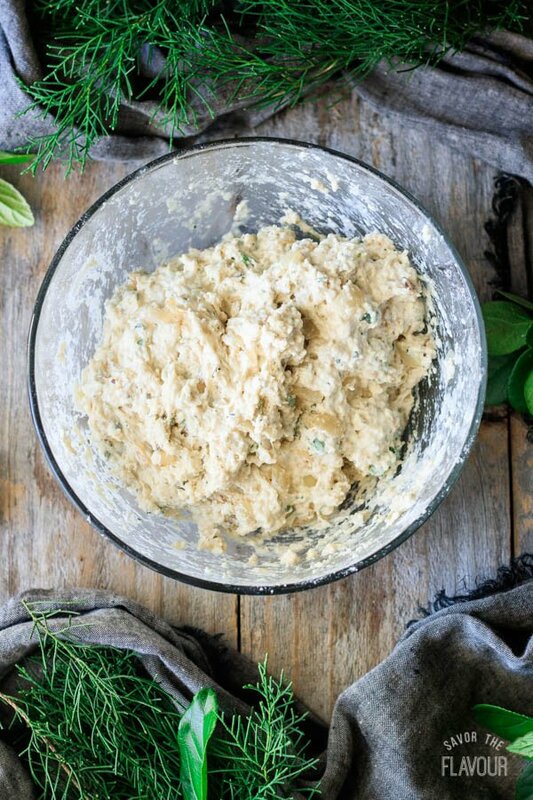 Don’t over mix, as this will build up the gluten structure in the dough and make a tough, doughy loaf. Working quickly, form the dough into a ball on a lightly floured surface, handling the dough as little as possible. Pat the top down gently and place on a large baking stone or parchment-lined cookie sheet. Score the dough in an X shape with a large, sharp knife. Cut almost all the way through, but make sure to leave the four quarters (called farls) attached. The scoring allows the heat to penetrate the dough much better. Immediately bake at 400 F for 45-55 minutes, until the base and top are well browned and the loaf has risen completely. The loaf’s internal temperature should be about 200 F.
Leave to cool completely on a wire rack before serving. The bread finishes cooking through the middle as it cools. Serve with butter. The four distinct quarters that make up a loaf of soda bread are called farls. If you’re hungry, you might want to eat a whole farl by yourself!